This NASA/ESA Hubble Space Telescope image shows the edge-on profile of the slender spiral galaxy NGC 5775, which is surrounded by a halo of gas that astronomers suspect is kicked up by star explosions like a galaxy-size fountain. A new photo from the Hubble Space Telescope has revealed what scientists have called a veritable galactic "fountain of youth," one that would turn the fictional pirate captain Jack Sparrow of the "Pirates of the Caribbean" films green with envy. The new Hubble image shows the galaxy NGC 5775, which is located about 85 million light-years from Earth in a group of galaxies called the Virgo Cluster. 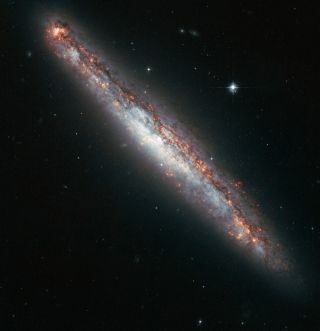 NGC 5775 is a spiral galaxy that is tilted away from Earth in such a way that only its edge is visible. This edge-on position of the galaxy has allowed astronomers to spot a vast halo of hot gas around NGC 5775, but how the material actually got there is unclear, researchers said. The two spiral galaxies are on a collision course and are in the early stages of merging, according to Hubble scientists. However, neither object has yet sprouted a tidal tail of gas and stars — created by intense gravitational disruptions — that typically precedes galaxy mergers. The Hubble Space Telescope is a joint project by NASA and the European Space Agency.